These vertical systems come complete. They are an all-in-one package unit. 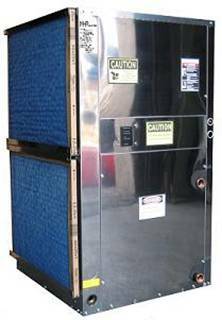 Completely pre-charged with R410A, blower, circuit diagnostic boards, scroll compressor, filter housings, cupro-nickel exchanger. You can choose for a left or right return with the supply at the top. Also available with a 2-Stage Compressor.